Kawasaki's VP of marketing tells PRWeek the inside story of how the biggest brand integration of Oscars night came to be. 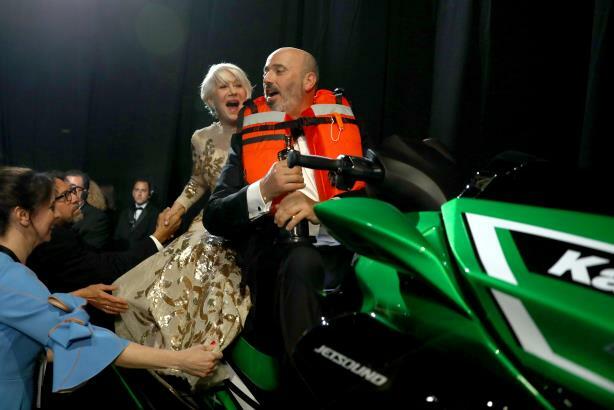 BURBANK, CA: Two weeks before Sunday’s Oscars ceremony aired, the Academy of Motion Picture Arts and Sciences reached out to Kawasaki with an idea: to award a Kawasaki Jet Ski Ultra 310LX to whoever delivered the shortest acceptance speech of the night. "They had the original idea and brought it to us," said Chris Brull, VP of marketing for Kawasaki Motors U.S.A. "[Our first reaction was] ‘Is this for real?’ It was such an obviously cool idea for us." The Academy was very specific about two things: the model of Jet Ski it wanted to give away, and the top secret nature of the plan until Oscars host Jimmy Kimmel announced it live. Brull said Kawasaki immediately jumped onboard but with its own major caveat: Kawasaki must be "taken seriously" and not be made the object of fun during the show. "Knowing this was a high-visibility opportunity, we didn’t want any surprise people sitting on the unit," said Brull. "We told them that whoever is on the unit has to be very classy. It doesn’t get classier than Helen Mirren. The fact she had fun with it made it an even bigger smile for us." Kawasaki also specified that it did not want to be part of any causes, because the brand is not about that – it is "all about fun." "Knowing that there were heavy topics that had to be covered, which [Kimmel] did very well in his opening monologue, they wanted to balance that with fun," said Brull. "So we agreed to it, knowing we could be part of the fun." The Academy gave Kawasaki a copy of the show’s script, which was "spot on" and needed no changes, Brull said. Kawasaki’s main reason for agreeing to the brand integration was the "Super Bowl-level" awareness it would create for the Jet Ski. "How many awards have been given out after the Best Picture? None," said Brull. "But we were given away as an award after the biggest award." Kawasaki orchestrated a social media campaign during the Oscars on its Instagram and Twitter accounts with its agency Fuse Interactive. "We also submitted our social media ideas to the Academy Awards team," said Brull. "They accepted the plan, reviewed it, and approved it." Kawasaki posted polls, images of the Jet Ski, gifs, and retweeted news coverage of the giveaway and celebrity posts about the Jet Ski. At the end of the show, Kawasaki tweeted a post about the winner, Mark Bridges, Academy Award Winner for Best Costume Design for Phantom Thread. "We were trying to engage with our audience and new audiences," said Brull. "We saw an increase to our website and our Jet Ski product pages, so we hope to see new customers when all is said and done." Organically, Oscar winners mentioned the ski throughout the event. Brull noted that "none of that was planned ahead of time." Aside from social media posts, Kawasaki sent out a press release on March 6 about its Oscar debut. Brull hinted that there is "more to come" with this campaign involving Jet Ski winner Bridges. "We want to work with him but we are respectful that he is an accidental brand endorser," said Brull. "You can never take back the photos of him and [Mirren] on the Jet Ski. If he is up for some things, we are too." Kawasaki’s in-house PR team, Next Level Sports Management, worked on the campaign. Apex Marketing Group tweeted on Monday that the Jet Ski prize at the Oscars provided Kawasaki with "$2.3 million of equivalent brand value. Kawasaki's Jet Ski was mentioned in Oscars coverage in outlets including The New York Times, The Washington Post, Time, People, Newsday, Fox News, and others. Asked about the budget, Brull said it was $17,999--the cost of the Jet Ski. "We are always going to be part of the 90th Oscars," added Brull. "That is a cool takeaway."